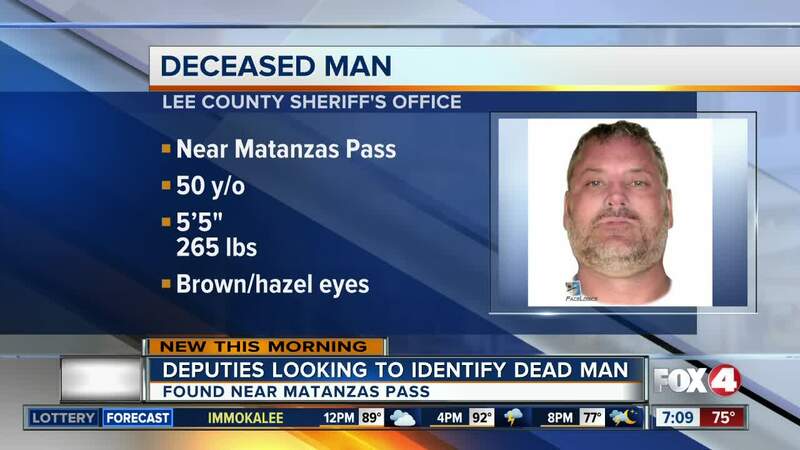 LEE COUNTY, Fla. -- Deputies need help identifying a man found dead in the water this past weekend. Foul play isn't suspected. The body was found around 8 o'clock Sunday morning floating in the water near Matanzas Pass. The man was only wearing a grey/black/red bathing suit, a grey t-shirt and red/black/white Nike sneakers. The victim is about 50 years old, weighing about 265 pounds and 5' 5" tall. If you have any information, call Lee County Sheriff's Office Major Crimes Unit at 239-477-1000 or 239-477-1050. Or call Crime Stoppers at 1-800-780-TIPS (8477). All callers to Crime Stoppers will remain anonymous.